Stylish twin diesel engined cruiser built in 1958 with a Fibreglass hull and deck with wooden topsides. This boat was built for a very discerning owner who kept the boat in its early years on lake Windermere. It was housed in its own covered boatshed, and the present owner has lots of history including receipts and owners log books. What a craft! Where do we start, seeing is believing!!! Two owners only and has retained the 1950's style. The fwd berths extend both sides for extra width, The quarter berths in the aft cabin are 3ft 6ins wide. The period saloon is a good size and the engines located amidships are easily accessible. All the fixtures , woodwork, flooring, upholstery along with the colour pattern is as it was when built. Externally, neatly placed housings for the wiring covers to the various deck equipment are fitted. Underway what a sound!! "Music to the Ears" I say! The exhausts are side mounted and she purrs. This boat is at home either cruising the inland waterways or coastal. An original classic presented in good order. 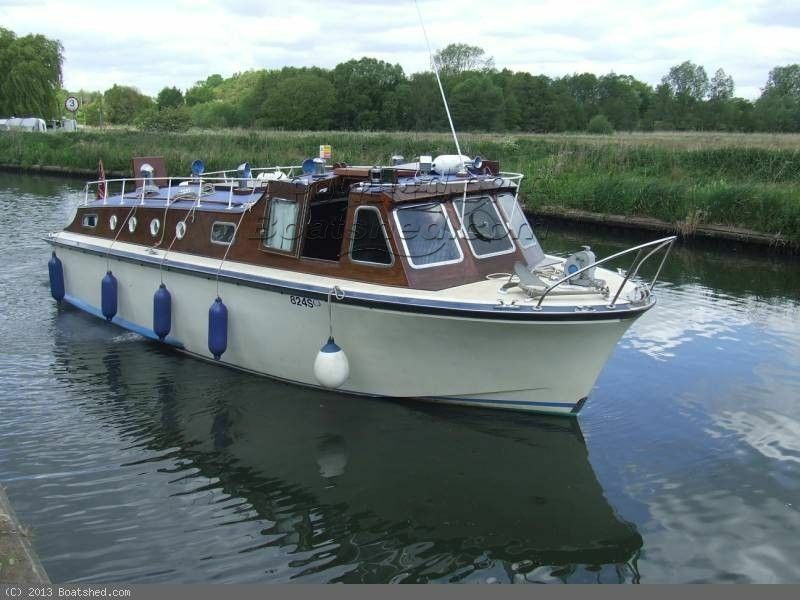 This Halmatic 30ft Gentlemans Cruiser has been personally photographed and viewed by Gary of Boatshed Norfolk. Click here for contact details.